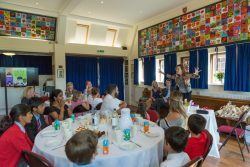 Each year Cranleigh Prep School host a Creative Writing Competition for local schools. On Thursday Year 6 pupils from Cranleigh C of E, Loxwood, Park Mead, Rudgwick, St Cuthbert Mayne, Wonersh and Shamley Green, Wisborough Green and Surrey Hills C of E Primary Schools were all invited to take part. Pupils were encouraged to submit a piece of writing, of no more than 500 words, using the title ‘Happiness’. Alternatively, pupils were also able to submit pieces, of the same length, that they were currently working on. We had an excellent response, with many children entering the competition. The standard of writing was extremely high, and we were thrilled with the wonderful presentation and variety of the work. Finally, 15 winners were chosen and we were delighted to welcome 11 of them to our Prize Giving Tea Party last week. Children met M.G. 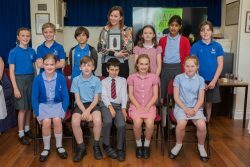 Leonard, author of The Beetle Boy Trilogy and our Patron of Reading, who gave a wonderful, entertaining presentation about the inspiration behind her work, including many interesting facts about beetles and how she overcame her fear of insects. She then read each of the children’s writing aloud, to an audience of very proud parents and siblings, as well as some very impressed CPS staff! All winners received a Cranleigh goodie bag and a signed novel from M.G. Leonard. All participants, winners and entrants to the competition, were given a certificate.